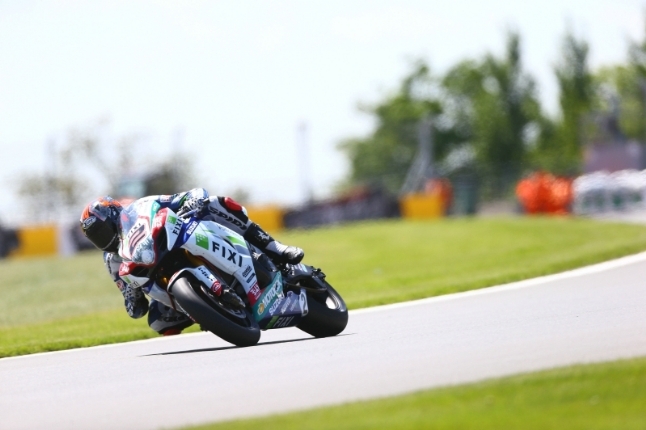 FIXI Crescent Suzuki’s Leon Camier put in his best qualifying performance of the season at the teams home round of the World Superbike Championship at Donington Park in Leicestershire today. The 2009 British Superbike Champion had, for the first time this season, enjoyed a consistently fast pace in this mornings qualifying session after Friday’s free practice sessions were lost to the British weather. The lanky Kent man and his team were delighted to post the third fastest time in that session ahead of afternoons intense Superpole session. The first part of Superpole was routine for Camier, posting a time on par with the leaders to safely see him through to the second part of the WSB qualifying system. Again Camier and his Fixi Crescent Suzuki GSX-R 1000 posted comfortably fast times but, quite tellingly ahead of tomorrows races, using a race compound tyre rather than a softer ‘qualifying’ tyre. As the riders in Q3 of Superpole all upped their game Camier held third place and a front row start for much of the session but was narrowly bumped back two places in the dying stages to start from the middle of row two for tomorrows first race with a best time just 0.874s shy of Tom Sykes’ blistering pole lap. Previous Previous post: Guintoli "It would have been difficult to take pole from Sykes the specialist"